With "demographic" facts proving beyond any doubt that the Cauasian race is dying out 5 or 6 for every 1 born (while other "people of color" berth-in 7 to 9 to our 1), it can easily been considered how this gaggle of happy goslings is indeed a rare, and increasing rarer, sight. The bitter result will become obvious soon enough. 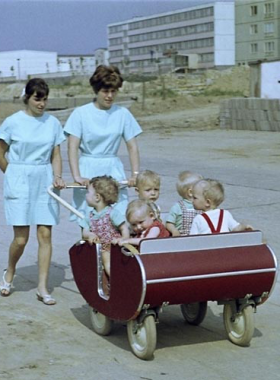 This image was recorded in modern Germany; whether these are mothers or nursery caretakers, is not known.